This paper presents a summary of reported cases of Serious Adverse Events (SAEs) following treatment with Mectizan® (ivermectin, Merck, Sharpe & Dohme) in onchocerciasis mass treatment programs from January 1, 1989 to December 31, 2001 through a passive surveillance system. A total of 207 SAE cases were reported out of approximately 165 million reported treatments delivered during the period under review, giving rise to a cumulative incidence of 1 reported SAE per 800,000 reported treatments. The mean age was 40 years and 70% of the cases were males. The mean time between ivermectin intake and onset of illness was 1 day. For 57% of the cases (n = 118), that was their first exposure to ivermectin. The majority of cases were reported from Cameroon (n = 176; 85%) with peaks in the incidence of SAE reporting in 1989–1991 and 1994–1995 when the program expanded to ivermectin-naïve populations. Fifty-five percent of the cases from Cameroon (i.e. 97 out of 176 cases) were encephalopathic and were reported from the central-southern region of the country; two-thirds of these cases were 'probable' or 'possible' cases of Loa loa encephalopathy temporally related to ivermectin treatment. Reporting bias may explain some but not all of the differences in SAE reporting between the 34 onchocerciasis-endemic countries that have, or have had, mass treatment programs. Further research is needed to understand the apparent clustering of encephalopathy cases in central-southern Cameroon since L. loa infection alone probably does not explain the increased incidence of this type of SAE from this region. The Mectizan® Donation Program (MDP) was established in 1988 to provide medical, technical and administrative oversight for the donation of Mectizan® (ivermectin, Merck Sharpe & Dohme) by Merck & Co., Inc. for the control of onchocerciasis worldwide. From 1989 to the end of 2001, approximately 165 million ivermectin treatments were reported as having been administered in onchocerciasis mass treatment programs in Africa, Latin America and Yemen (MDP, unpublished data). Minor adverse drug events such as fever, headache, pruritus, lymphadenopathy and myalgia are usually associated with the rapid death of the microfilariae of Onchocerca volvulus and typically occur upon first exposure to the ivermectin . Serious Adverse Events (SAEs) were found to occur rarely in large clinical and community trials of ivermectin conducted in West Africa in the 1980s [1–3]. A passive surveillance system for SAEs following ivermectin treatment is required of all onchocerciasis mass treatment programs. The regulatory definition of SAEs (See note 1) as well as SAE reporting forms, is provided by MDP to the program managers at the time of initial application for ivermectin. Program managers are required to promptly report any SAEs temporally related to ivermectin treatment to the MDP or Merck when they occur. Furthermore, as part of the treatment report that program managers submit to the MDP annually, they are asked to report any SAEs that may have occurred during the previous treatment cycle. This review paper represents a summary of all the SAE cases reported to the MDP as having occurred since the implementation of onchocerciasis mass treatment programs in 1989 to the end of the calendar year of 2001. As of August 31, 2002 a total of 207 SAE cases following treatment with ivermectin had been reported to the MDP as having occurred within the context of onchocerciasis mass treatment programs from January 1, 1989 to December 31, 2001, primarily through the passive surveillance system described above. This corresponds to a cumulative incidence of approximately 1 reported SAE per 800,000 reported treatments delivered for the 13-year period under review. Figure 1 illustrates the number of cases reported to have occurred annually since 1989. Approximately 70% of the cases (n = 146) were male and the mean age was 39.7 years (95% CI: 37.2, 42.2). The age distribution of the cases is shown in Table 1. *cases reported as of August 31, 2002; †the ages of 8 cases remain unknown. For more than half of the cases (n = 118; 57%), the SAE occurred following their first exposure to ivermectin. The mean time from ivermectin treatment to onset of symptoms was 2.2 days (95% CI: 1.8, 2.5) and the mean time from onset of symptoms to seeking medical help or coming to medical attention was 3.9 days (95% CI: 2.1, 5.8). The 10 most frequent initial symptoms and signs reported are presented in Table 2. Of the cases with altered mental status when first encountered by a clinician (n = 106), 52 were confused, obtunded or lethargic while 16 presented with stupor and 38 presented in frank coma. *cases reported as of August 31, 2002; †total of individual percentages is greater than 100 because most patients presented with multiple symptoms and signs. Once an SAE was reported to the MDP, a presumptive diagnostic categorization was systematically applied, based on information available in the SAE reports and medical records (see Table 3). For these 207 reported SAE cases, the diagnostic breakdown is shown in Table 4. The treatments administered to these patients were primarily supportive, the most common of which was intravenous fluids (IVF). Table 5 illustrates the frequency of use of IVF and other therapeutic interventions. The duration of specific treatment regimens was rarely reported except for steroid use where 19 reports provided this information. The longest duration of steroid use was 15 days and the mean duration was 4.4 days (95% CI: 2.6, 6.3). A total of 113 out of the 207 reported SAE cases (55%) were reported as being hospitalized; the length of hospital stay varied widely from 0 to 241 days with a mean of 14.5 days (95% CI: 9.6, 19.4). *All cases met the definition of an SAE (See note 1) before being assigned one of these presumptive diagnoses; †adapted from McGavin DDM (1998). Opthalmology in the Tropics and Subtropics. In Manson's Tropical Diseases. 20th edn. (ed. GC Cook GC) W. B. Saunders Co. Ltd, London, p. 248; ‡adapted from Gardon J et al. .
*cases reported as of August 31, 2002; †see Table 3 for definitions of presumptive diagnoses. *cases reported as of August 31, 2002; †total of individual percentages is greater than 100 because multiple treatments were administered per person in most cases. 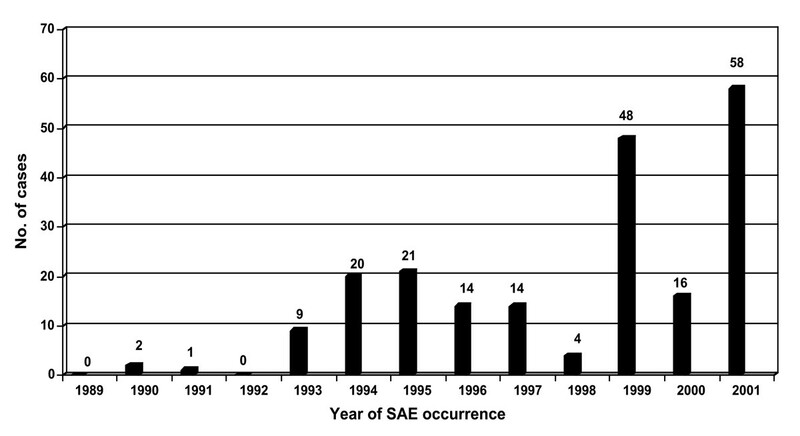 The clinical outcome of the SAE cases was documented for 137 of the 207 total cases (66%). As shown in Table 6, for those whose outcome is known, the majority of cases recovered fully. There were a total of 28 deaths, corresponding to a cumulative case-fatality rate of 20.4% if only the cases where outcome is known are included in the analysis (n = 137). If all cases where outcomes are unknown are considered to have survived, this rate decreases to 13.5% of the 207 total reported SAE cases for the period under review. *cases reported as of August 31, 2002; †there were 2 cases of scarring due to drug skin reaction, 1 case of permanent soft tissue damage due to severe decubitus ulcers, and 1 case of nephrotic syndrome which predated the SAE; ‡the clinical outcome was not documented in 70 cases. The cause of death was difficult to determine in most cases due to the paucity of diagnostic information documented in the SAE reports and the medical records. Inpatient complications such as infected decubitus ulcers, and/or hypoglycemia and/or dehydration were antecedents to death in 12 of these 28 patients. In 3 other cases, patients were temporarily taken out of the hospital by family members, against medical advice, to seek the help of traditional healers, and later returned to the hospital before they ultimately died. In addition, an 11-year old boy that died was administered ivermectin despite overt contraindications to treatment; an undiagnosed acute illness severe enough to prevent him from going to school the morning before taking treatment. Scenarios such as these present challenging confounding factors that preclude determination of the actual cause of death. Out of the 34 onchocerciasis endemic countries that have had, or currently have, ivermectin mass distribution, SAEs had been reported by only 7 during the period under review (see Figure 2). Eighty-five percent of the SAE cases were reported from Cameroon: 176 out of 207 (see Figure 3). Yet less than 5% of ivermectin treatments worldwide have been administered in Cameroon (MDP, unpublished data). The number of cases reported from Cameroon is compared, on an annual basis, to the 6 other countries that have ever reported SAEs from 1989 to 2001 in Figure 4. Since annual treatment figures are difficult to quantify, cumulative incidence rates over 2 to 3 year time-periods for reported SAEs for the neighboring countries of Cameroon, Central African Republic, Democratic Republic of Congo and Sudan are compared in Figure 5. 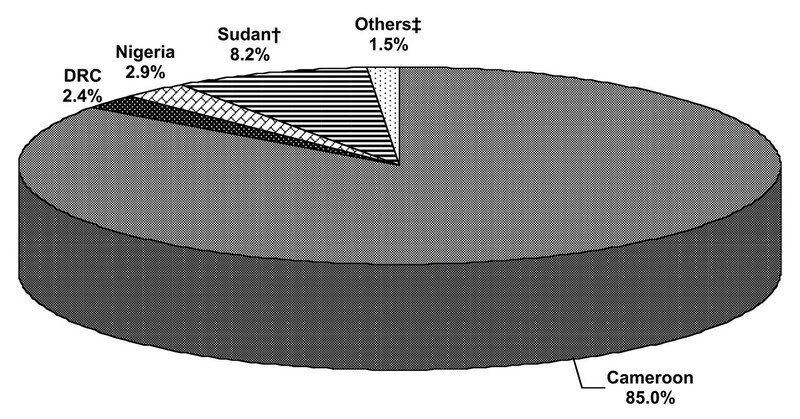 Proportion of SAEs reported to have occurred following ivermectin mass treatment from 1989 to 2001*, by reporting country; *cases reported as of August 31, 2002; † all reported cases from Sudan are from the southern region; ‡other reporting countries are Ethiopia (n = 1), Liberia (n = 1) and Central African Republic (n = 1). Annual frequency of SAEs reported to have occurred following ivermectin mass treatment from 1989 to 2001*, by reporting country; *cases reported as of August 31, 2002; †all reported cases from Sudan are from the southern region; ‡other reporting countries are Ethiopia (n = 1), Liberia (n = 1) and Central African Republic (n = 1). 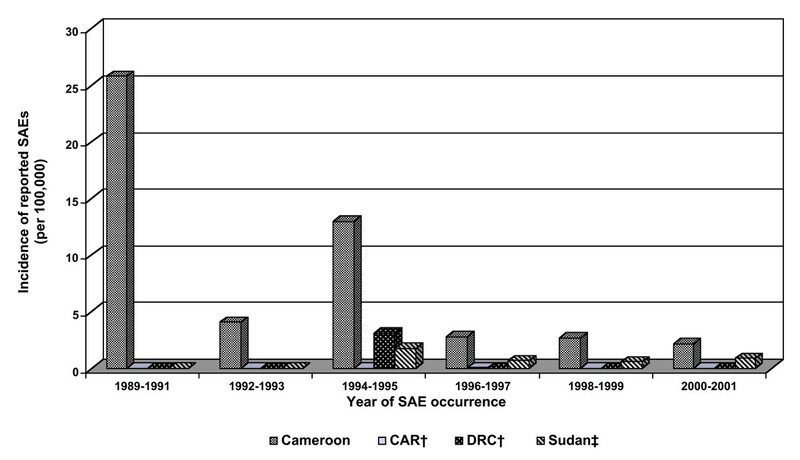 Incidence of reported SAEs following ivermectin mass treatment from selected countries in Central Africa, 1989 to 2001*; *cases reported as of August 31, 2002; † CAR=Central African Republic; DRC=Democratic Republic of Congo; ‡ all reported cases from Sudan are from the southern region. Seventy percent of the total caseload from Cameroon was male and 61% were taking ivermectin for the first time. The youngest individual affected was 6 years old and the oldest was 89 years old. The mean age was 39.9 years (95% CI: 37.2, 42.6). Peaks in SAE reporting in Cameroon occurred during 1989–1991 and 1994–1995; the majority of the cases reported during those time periods originated primarily from areas of program expansion where the population was generally naïve to ivermectin. Ninety-seven out of the 176 reports were of encephalopathic cases following ivermectin treatment. The first encephalopathic case occurred in 1990 and the year of peak reporting of encephalopathic cases was 1999 (n = 34). Table 7 compares the number and type of encephalopathic cases from Cameroon to those reported from other countries and Figure 6 illustrates the geographical distribution of the encephalopathic cases that occurred in Cameroon. As shown in Figure 2, all 97 Cameroonian encephalopathic cases occurred in the Loa loa endemic areas in the central-southern region of the country (Central, Littoral, West and South Provinces). Of these, there were 63 cases with sufficient L. loa laboratory data to support a diagnosis of 'probable' or 'possible' L. loa encephalopathy following ivermectin treatment in the context of a suggestive clinical description (See note 2) (see Table 7). *cases reported as of August 31, 2002; †See note 2 for definitions; ‡case of cerebral malaria; §Central African Republic = 1 case; Sudan (southern) = 1 case; ||Democratic Republic of Congo = 2 cases; Sudan (southern) = 1 case; Nigeria = 1 case. The most severely affected province was Central Province which reported 53 out of the 63 (84%) 'probable' or 'possible' L. loa encephalopathy cases. Peak reporting was from the District of Monatélé during the 1994–1995 treatment cycle (n = 17) and from the District of Okola in the 1999 treatment cycle (n = 25). Both of these peaks coincided with the first year of mass treatment in a population that was generally naïve to ivermectin. Incidence figures per district were generally impossible to calculate since the annual report forms do not require projects to report treatments administered at the district level. 8. Where clinical outcome is known (i.e. in approximately two-thirds of the cases), 70% recovered fully and 20% died. 9. Eighty-five percent of SAE cases were reported from Cameroon with peak reporting coinciding with program expansion into ivermectin-naïve areas; similar observations were not been reported from other countries. 10. Approximately 50% of the reported cases were encephalopathic illnesses, of which 94% were reported from Cameroon. 11. 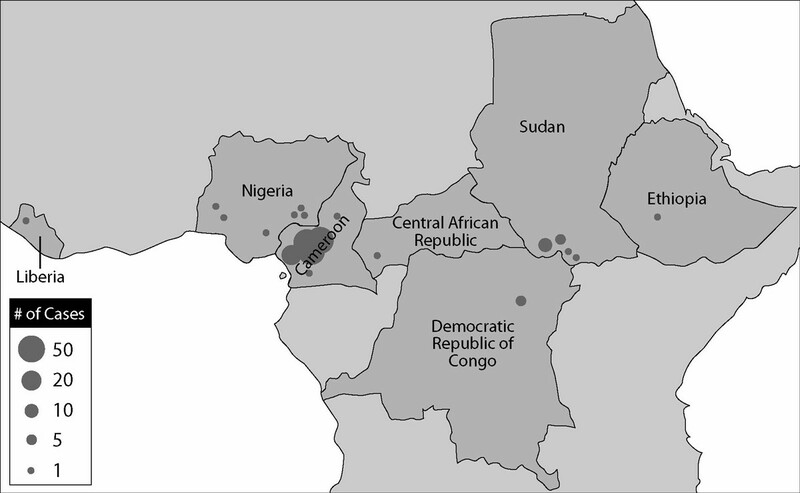 All the encephalopathic cases from Cameroon were reported from the central-southern region of the country; two-thirds of which were presumed to be associated with high intensity L. loa infection. When all 34 onchocerciasis-endemic countries are considered together, the incidence of reported SAEs following ivermectin treatment appears to be low: approximately 1 case per 800,000 treatments. However, when Cameroon is considered separately the incidence of reported SAEs in general, and reported encephalopathic SAEs associated with L. loa in particular, are much higher. This difference is even more striking when Cameroon is compared to other L. loa endemic countries of Central Africa that also conduct mass treatment of onchocerciasis with ivermectin. Some areas in the central-southern region of Cameroon, where the L. loa encephalopathy cases in this study predominate, have been shown to have L. loa prevalences as high as 20% . Although detailed observed loiasis prevalence data is limited for other African countries, a map of predicted loiasis prevalence using Geographic Information Systems (GIS) and remote sensing technologies suggests that other countries in Central Africa have prevalences as high as those observed and predicted in Cameroon . Since individuals with high L. loa microfilaremia have been demonstrated to have an increased risk of developing an encephalopathic illness following ivermectin treatment [5, 6] and a strong correlation has been found between the prevalence of loiasis and the prevalence of individuals with high intensity L. loa microfilaremia (> 30,000 microfilariae per milliliter of peripheral blood) , one would expect similar rates of reporting of post-treatment L. loa encephalopathy from other Central African countries if intensity of L. loa infection was the most important risk factor for developing encephalopathy following treatment with ivermectin. Three primary phenomena may explain this differential reporting of SAEs (encephalopathic or otherwise): 1) reporting bias; 2) as yet unidentified confounding factors in central-southern Cameroon which increase individual vulnerability to ivermectin; and 3) genetic variations in the strains of L. loa and/or its vector, Chrysops spp. which make the local species more virulent or neuropathic in this region of Cameroon. There may be under-reporting of SAE cases from countries other than Cameroon. The SAE database of the MDP is based almost exclusively on reports received from clinicians and program participants through a passive surveillance system (there were 7 documented cases abstracted from prospective studies conducted by researchers in Cameroon in the context of ivermectin clinical studies or mass treatment programs [5, 6, 9] that have been included in this analysis). Thus, it is difficult to be certain that the reported number of cases represents the actual number of cases that occurred in the field. In the case of very severe clinical conditions such as encephalopathy it is likely that those cases will come to the attention of community leaders and health workers locally, and thus would likely be reported to national-level staff who would then report them to the MDP. However, in the case of less severe clinical conditions which may still be serious, as defined from a regulatory perspective (See note 1), and thus qualify as an SAE, it is possible that some degree of under-reporting may exist. 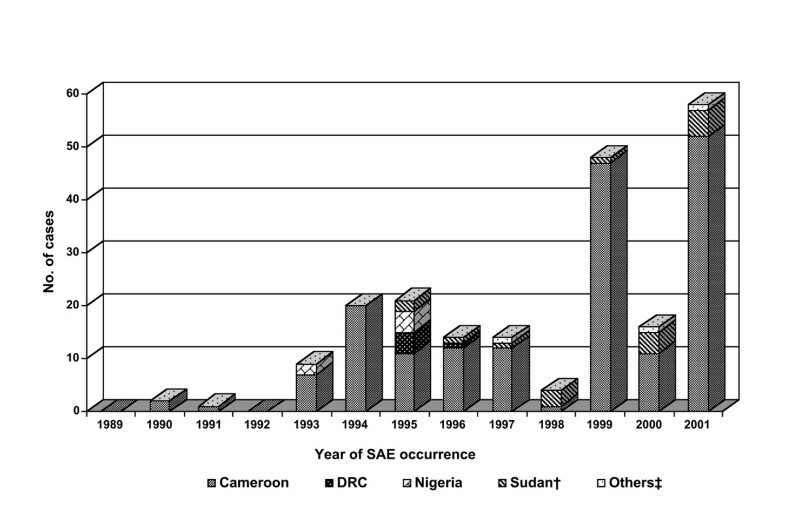 Conversely, there may be over-reporting of SAEs in general from Cameroon, particularly in recent years. Increased awareness and sensitization of the population and healthcare workers after the cluster of encephalopathic SAEs in Cameroon in 1999, has most likely improved the quality of their surveillance system. However, it may also have had an untoward effect in subsequent years. For example, 72% of the 47 SAE cases reported in 1999 were encephalopathic whereas in 2001, 52 SAE cases were reported of which 33% were encephalopathic in nature while almost 50% were categorized by MDP as mild Mazzotti reactions. In addition, the passive surveillance system for SAEs is of varying quality and completeness in different countries; this may explain some of the observed variation in SAE cases reported from the 34 countries which have, or have had, mass treatment programs. Furthermore, even when the SAE forms are submitted, they are sometimes incomplete. Therefore the assignment of presumptive diagnoses was sometimes based on limited clinical and laboratory data which may have introduced a misclassification error. The MDP is currently in the process of trying to improve both the quality and completeness of the SAE reporting system. Reporting bias may account for some of the quantitative and qualitative differences in reporting but would not be expected to explain all of the qualitative differences in the types of illnesses reported from the different countries following treatment with ivermectin. It certainly does not explain the seriousness of the problem in Cameroon, especially not in Central Province from where the majority of the L. loa associated encephalopathic cases have been reported. It is important to note that not all individuals heavily infected with L. loa develop encephalopathy following ivermectin treatment. Thus, there is an urgent need to investigate other individual risk factors that may work alone or synergistically with high intensity L. loa microfilaremia to increase vulnerability to developing an encephalopathy following ivermectin treatment. Potential candidates may be human genetic differences in metabolism and/or the blood-brain barrier, and interactions with other pharmaceutical agents, herbal preparations or alcoholic beverages that may be ingested at the same time as ivermectin. Genetic differences in the local strains of L. loa and/or the Chrysops vector and any association that these differences may have with virulence and pathogenesis, may also explain the apparent clustering of cases of L. loa encephalopathy temporally related to ivermectin treatment in Central Province. Finally, factors pertaining to the community and the local health system such as effectiveness of surveillance and evacuation system in the community, distance from a health facility, presence of a functioning referral system from primary to tertiary health facilities, availability of supportive therapy, presence of staff trained on SAE management and hospital discharge policies will need to be assessed and strengthened as they may significantly impact the clinical outcome once the SAE develops. Following the increased number of encephalopathic SAE cases reported from Cameroon in 1999, the Mectizan® Expert Committee (the technical advisory body that oversees the use of Mectizan®, the donated form of ivermectin) and the Technical Consultative Committee of the African Programme for Onchocerciasis Control (the technical advisory body that oversees the implementation of community-directed treatment with Mectizan® in most of Africa) implemented new recommendations for ivermectin mass treatment strategies in L. loa endemic areas to reduce the risk of death and disability in the rare event that a case of L. loa encephalopathy occurs following treatment. Specifically, in areas where the population is naïve to ivermectin, and/or there have been fewer than 2 annual ivermectin treatments, and/or less than 60% therapeutic coverage of the community in previous treatment rounds, and/or where there have been cases of post-treatment encephalopathy, it is recommended that refined epidemiologic criteria are applied before a given community is included in an onchocerciasis mass treatment program with ivermectin. In addition, an intensified system of health education, SAE surveillance, referral and clinical management needs to be put in place before mass treatment may begin. These measures are designed to reduce poor clinical outcome even if they are not able to reduce the risk of the event occurring. However, the individual risk of developing an SAE, including post-treatment L. loa encephalopathy, dramatically decreases after sequential annual doses of ivermectin due to the strong reduction of the microfilariae of both O. volvulus and L. loa [1, 10, 11], the chemotactic behavior and death of which are presumed to trigger the symptoms and signs experienced by the patient [1, 5, 6]. In fact, in the case of post-treatment L. loa encephalopathy there were only 2 out of the 65 total reported cases (3%) in which the individual had reportedly taken ivermectin in the previous 12 months. Thus, if ivermectin treatment is administered annually at high levels of coverage (both therapeutically and geographically) then the occurrence of all SAEs should be reduced to negligible levels, allowing the benefits of treating onchocerciasis to be more fully appreciated in affected communities. Sole author developed case definitions (except for that of an SAE case which is the standard definition used by Merck & Co., Inc.), performed data entry, analyzed and interpreted the data, and prepared the manuscript. The author wishes to express great appreciation to field program partners of the Mectizan® Donation Program who reported the SAEs and to Dr. Björn Thylefors for reviewing the manuscript and providing excellent feedback for revisions. Peripheral blood L. loa > 10,000 microfilariae per milliliter of peripheral blood (mf/ml) pre-treatment, or > 1,000 mf/ml within 1 month post-treatment, or > 2700 mf/ml within 6 months of treatment; and/or L. loa microfilariae present in cerebrospinal fluid (CSF). Semi-quantitative or non-quantitative (i.e. +, ++, +++) positive L. loa microfilariae in peripheral blood within 1 month post-treatment. These definitions are adapted from those originally put forth by the independent experts that consulted for the MDP in 1995, in the report "Central Nervous System (CNS) Complications of Loiasis and Adverse CNS Events following Treatment: Report of an invited consultation, 2–3 October 1995" (Atlanta, GA: Mectizan® Donation Program, 1996).